A guy from Boston folds stuff from paper. Kunihiko Kasahara has created a lovely wild rose pattern. Early on, I discovered that it was possible to place a half-size rose within a larger one. (This is my "design" contribution.) By placing a white rose inside a red rose, I achieved the anglophile origmi enthusiast's dream: a Tudor Rose. This model was created from a 5 7/8" square of red, a 3" square of white, and a 3" square of green standard origami paper. The rose is 3 1/8" in diameter with a leaf of similar length. 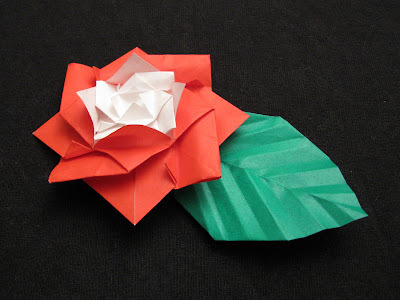 The pattern for the rose is found in Kasahara's masterwork, Origami Omnibus. The leaf was designed by Gay Merrill Gross; a pattern for it may be found in Michael J. LaFosse's "Origami Flowers" kit. Oh that reminds me to move The Tudors season one up in my Netflix queue. I'm a software engineer who relaxes by folding paper. This blog shows off some of my works. Now updated weekly!